This recipe is a fun frozen twist on my Healthy Dairy-Free Yogurt Mousse Recipe. It's rich, creamy and not the least bit watery. Note that the Prep Time does not include chilling times. Place the cashews in your spice grinder or small food processor and whiz until finely ground / powdered. Place the ground cashews, yogurt, lemon juice, seeds scraped from the vanilla bean or vanilla flavoring, and salt in your blender and puree about 30 seconds or until smooth. You want to avoid blending too long, as it can heat up the yogurt! Blend in honey or agave nectar, to taste (making it just a touch sweeter than you would normally eat). Chill in the refrigerator 1 hour, or longer if making ahead (up to overnight), just to allow the cashews time to soak up some of the moisture. Blend ⅓ cup of the dairy-free yogurt mousse with the blueberries (or strawberries). Divide the mixture between 6 medium-sized pop molds. Freeze 1 hour. 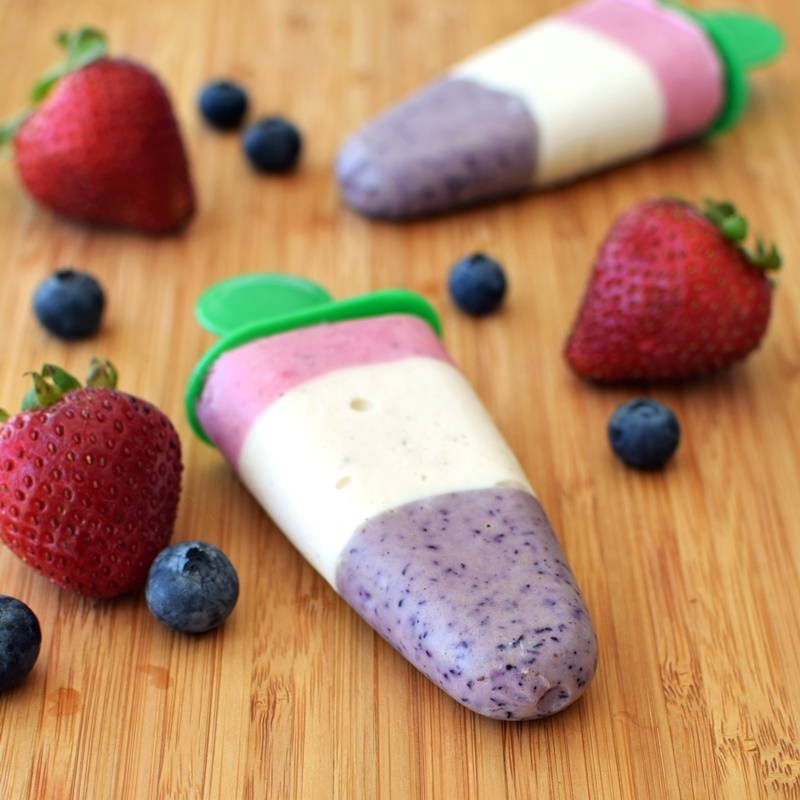 Top the pops with ⅔ cup (total) of the dairy-free yogurt mousse and freeze 30 minutes. Blend the remaining ⅓ cup dairy-free yogurt mousse with the strawberries. Divide the mixture between the pop molds, topping them off. Insert sticks and freeze until solid, about 2 hours. **I prefer to use real vanilla bean (those flecks!) or a non-alcoholic flavoring (since it isn't cooked). For both I use Simply Organic. *The amount of sweetener you use will depend on the ripeness / sweetness of your berries and your personal tastes. Keep in mind that treats taste a little less sweet once frozen. I used about ¼ cup (4 tablespoons) sweetener in my testing, which was pleasant and notably sweet, but I think you could go a little lighter with very ripe fruit.